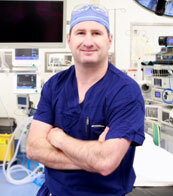 Dr Brett Fritsch specialises in arthroscopic and replacement surgery of the knee. He has a particular interest in sports injuries of the knee, ligament reconstruction, cartilage and meniscal pathology of the knee, and patella instability. Dr Fritsch has appointments at The Mater Private Hospital and North Shore Private in the Northern Sydney area, as well as at Royal Prince Alfred Hospital in Camperdown. He is a member of the Australian Orthopaedic Association, Royal Australiasian College of Surgeons and American Orthopaedic Society of Sports Medicine, and is a teaching surgeon at Royal Prince Alfred Hospital. Patients can be seen by appointment in his consulting rooms at Chatswood, North Sydney, Newtown, and at the Orthopaedic outpatient clinic at RPA. Brett Completed his Orthopaedic training in Sydney. He was then selected for fellowships in Sports Surgery at Duke University, North Carolina, USA and Advanced Arthroscopy at the Alps Surgical Institute in Annecy France. Brett has a keen interest in surgery aimed at keeping his patients active. He has a background as an elite level sportsman which stimulated his interest in techniques aimed at returning athletes of all levels to their recreational and occupational activity of choice. These techniques are applicable to all patients with knee pathology, with the aim to restore and prolong a lifetime of activity. When these reconstructive options have been exhausted, or are not suitable, arthroplasty provides a definitive solution.